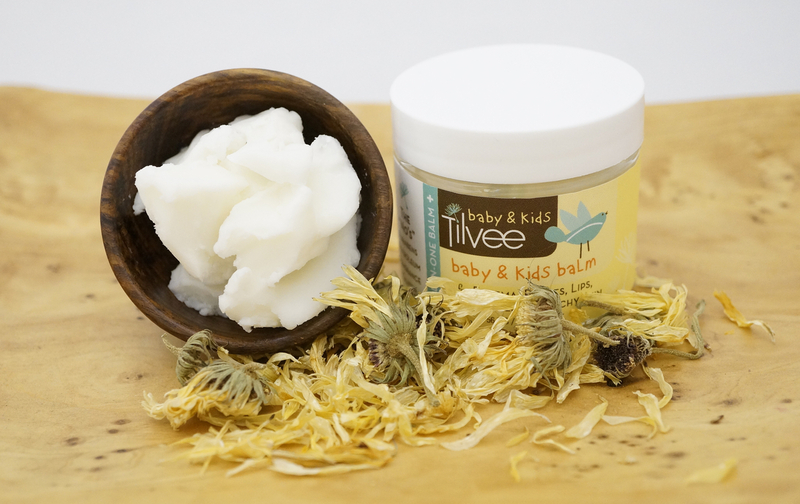 Our Baby & Kids all-in-one balm is a highly effective first aid salve for babies and kids delicate skin. Can you be used for adults too. Olea europaea (Olive) oil* infused with Stellaria media (Chickweed)* & Calendula officinalis (Calendula) flowers*, Butyrosperum parkii (Shea Butter)*, Cocos nucifera (Coconut) oil*, Beeswax*, Prunus dulcis (Sweet Almond) oil*, Persea gratissima (Avocado) oil*, Simmondsia chinensis (Jojoba) oil*, Essential oils of Lavendula angustifolia (Lavender), Citrus reticulata (Mandarin Orange), Melaleuca alternifolia (Tea Tree), Anthemis nobilis (Chamomile), Tocopherol (Vitamin E), Rosmarinus officinalis (Rosemary) leaf extract. For dry, itchy skin, irritations and more! Made with fresh pressed, therapeutic Calendula and Chickweed herbs. Apply as often as needed to the affected skin until it has healed, especially after bathing and at night before sleeping.